Gifted & Talented teacher Gloria Horn at Bailly Elementary (Chesterton, IN) has been encouraging the development of her students’ incidental vocabulary. First, she set the tone for word collecting. She read The Boy Who Loved Words, by Roni Schotter and Max's Words, by Kate Banks. Her students then become word detectives on the lookout for strong word choice within their everyday, incidental reading. With the tone established, Gloria then encouraged students to physically collect these new-found words. Each time a student came across a "good word," he wrote it on an index card and added it to the growing pool of words on a bulletin board. 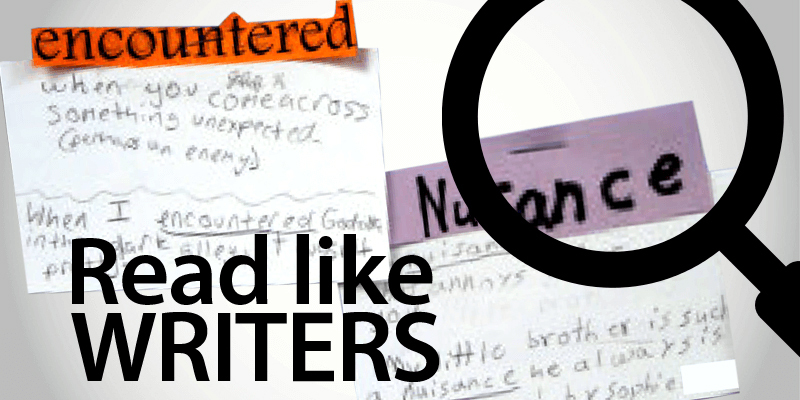 Gloria recognizes that to grow a student's writing vocabulary, you first have to grow a student's reading vocabulary. She is truly building wordsmiths--writers hungry to collect, learn, and utilize words! She didn't stop there. Gloria added a third element to this fabulous display. She honors that it is not helpful to just know of a word, you have to know what it means. So each index card includes a kid-friendly definition plus a sentence using the word appropriately. WOW! What a powerful growing bulletin board! Thanks for sharing, Gloria. Download a larger version of this bulletin board idea. River Valley Elementary School (Lemont, IL) principal Deb Lynch shared their own thematic display. 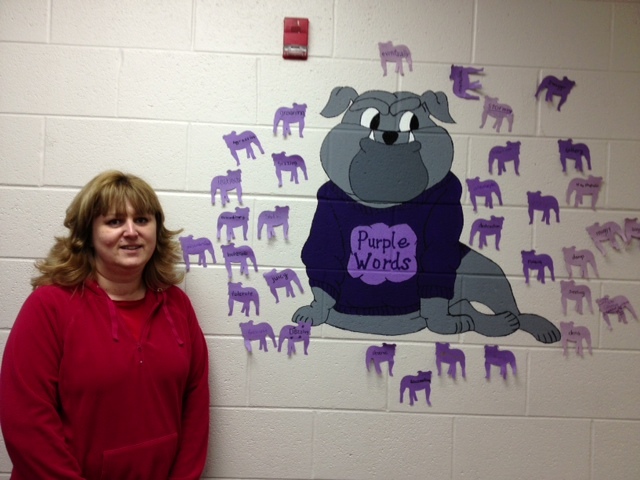 Pictured here is Lydia Assensi, the artist who painted a bulldog, the school's mascot, donning a purple-words shirt. 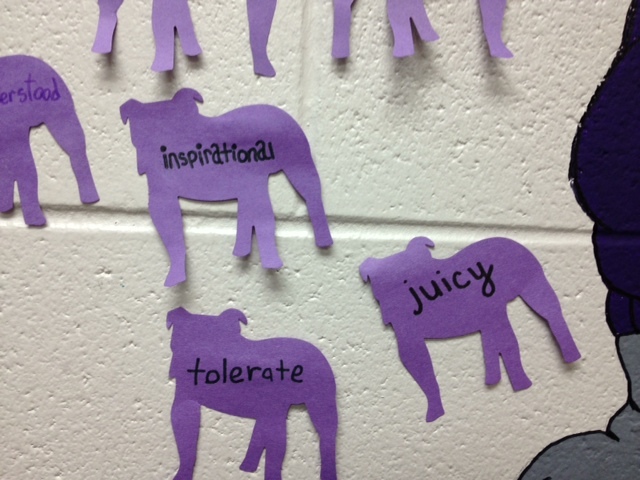 Students then added purple words on miniature purple bulldogs. What a great way to encourage strong word choice from all students in all grades and for years to come!